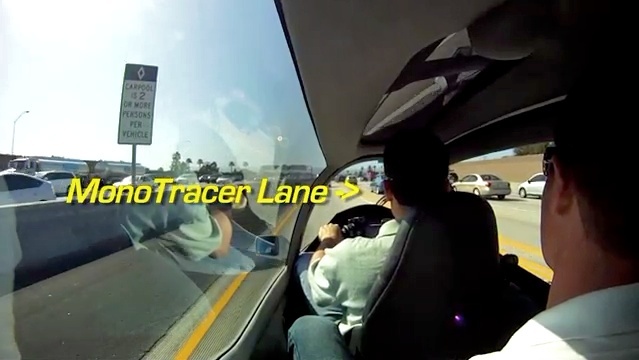 Lane splitting with the MonoTracer in SoCal helping to reduce congestion, fuel consumption, and emissions. I told her it’s because everybody is sitting in their cars alone and because a car occupies a whole lane, even if it’s just a little Smart. Or in fact a Prius, LEAF, whatever. Small cars or electric cars do not use less space in traffic nor do they punch a smaller hole in the air which would reduce their energy consumption. Nobody will drive closer to the back of a Smart just because it’s a shorter car. The Smart driver will leave an even bigger gap to the front because he does not have a crush zone on his car. Anyway, we continued for about a mile before she replied “hey, it’s really true, they are all in there just by themselves!”. The audience at Opportunity Green laughed. They wanted to hear more. There is no more. Why? This entry was posted in Peraves and tagged Electric Vehicle, lane splitting, LEAF, Mass Transit, MonoTracer, MonoTracer E, MonoTracer Lane, Nissan Land Glider, Opportunity Green, Prius, reducing congestion, SoCal, Tango. Bookmark the permalink. Revolutionary thinking but so true!